This afternoon’s post is for you. 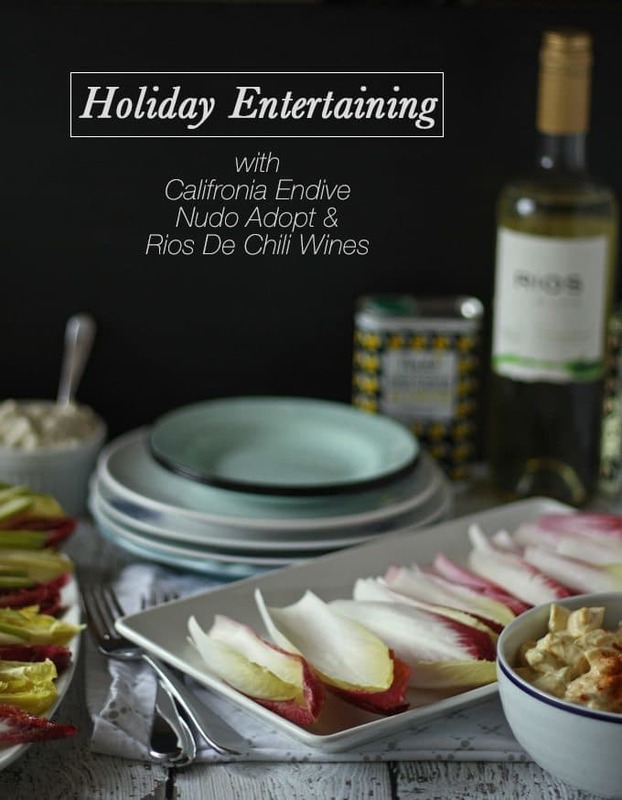 I’ve teamed up with California Endive, Nudo Olive Oil and Rios de Chile Wine to bring you my tips on holiday entertaining and two, yes TWO!, delicious appetizer recipes. Whether your hosting a big family gathering, or your annual ornament exchange party, the food and the table are what will set your event apart from meals past. I am a big fan of small plates. Not just the plates themselves, but the concept of taking a little bit of this and a little bit of that. Kind of like your guests are noshing the whole time. A great place to start is with a cheese plate. I could go on and on about how to set one up but it has been done before by many people more experienced than me. Follow these links to find out more about cheese plates: here, here and here. Once you have settled on the cheese its time to move on to dips. Dips are great because you can change them up depending on the party (or the guests). Your guests can take as much or as little of each one as they want – without feeling guilty. I don’t know about you, but if I take the last deviled egg, I feel like I’ve committed a party foul. I plan on making one of my favorite dips – deviled egg dip – and serving it for each of the parties I’m hosting this year. (recipe below!) Other fan favorites have included my family’s veggie dip recipe, this 8-layer taco dip and my recipe for slow cooker bean dip. We are dip people. With your awesome dips, come dippers. This usually means crackers, chips and veggies but this year we are changing it up a little. We’ve been using endive leaves as boats to house all of our dips. 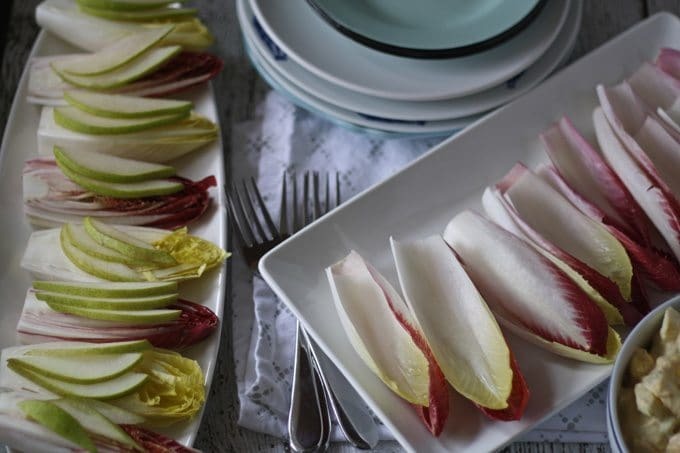 The crunch is great and fresh red and white endive add gorgeous color to your spread. Place a small pile of endive leaves next to your carrots and celery and your gluten-free and paleo guests will thank you for the variety. After dips, comes my favorite – finger foods. Past party favorites have included bacon wrapped dates and Parmesan and red pepper crisps. 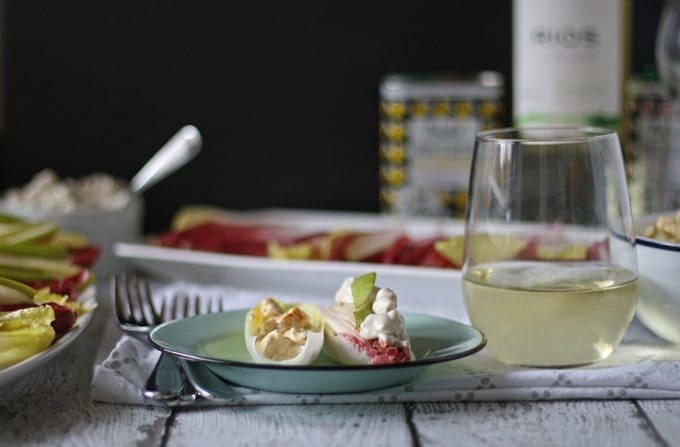 This year we are adding this mini endive wedge salad recipe (recipe below!) with homemade gorgonzola dressing. You know how much I love gorgonzola. Once your menu is set, it’s time to set everything out. I hold more casual gatherings than fancy, so you’ll often find my collection of mismatched dinner and salad plates on the table next to the food. I also like to take some of the ingredients I used in the recipes and leave those out on the table too, in case someone wants a little extra. In this case, I used Nudo Adopt olive oil in each of my recipes so it gets to grace my table with its presence. Wine and other beverages are also very important to a party. Make sure there is plenty of wine. I should have stressed this throughout the entire post because nothing gets a party conversation started like a glass of wine. 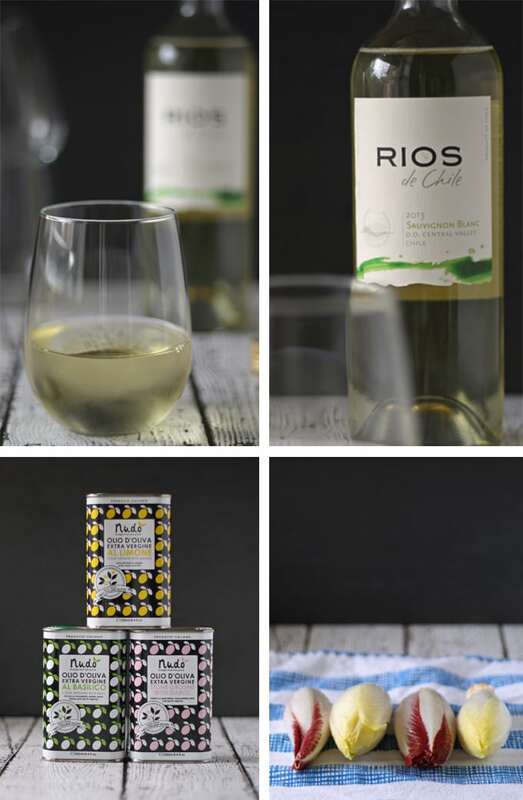 The Rios de Chile Sauvignon Blanc pairs very nicely with these appetizers. Combine all ingredients except for Gorgonzola dressing in a small bowl. Fold in the Gorgonzola dressing. Cover and chill for at least 1 hour before serving. Place the endive halves on a plate, cut side up. Layer 2-3 pear slices over each endive half. Spoon Gorgonzola dressing on top of the pears. Serve. That pretty much sums up how I plan for the holidays – food, more food, pretty plates and wine. If only everything in life was that simple. This post was brought to you by California Endive, Nudo Adopt and Rios de Chile Wine. I was provided with product samples as well as a gift certificate to Whole Foods to purchase the ingredients for these recipes. All opinions and recipe are my own. Your deviled egg dip looks like the perfect recipe for leftover Easter eggs! So unique! Pinned and shared. Have a terrific week! Love making dips for a party or just for snacking. Great tips for entertaining and wonderful dips! 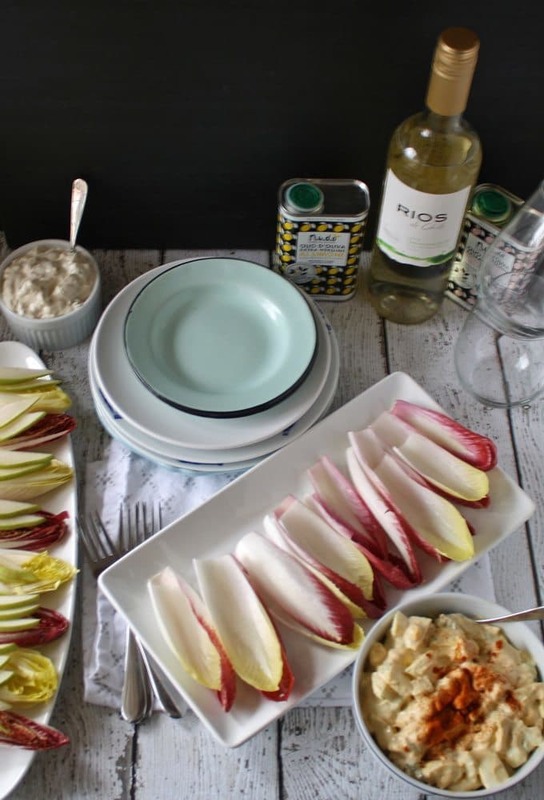 I love dipping endive into dips!